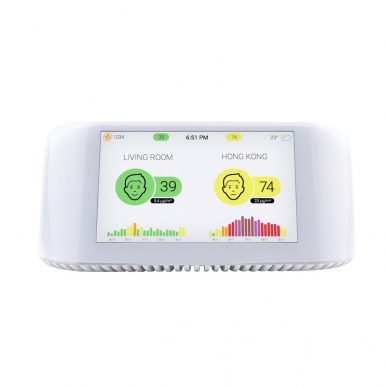 IQAir AirVisual Pro IAQ Meter and Monitor is a high quality indoor air monitor and meter (tester) that is portable and extremely user-friendly. The AirVisual Pro provides personalized data, alerts, and tips so you can enjoy the healthiest air. IQAir AirVisual Pro IAQ Meter and Monitor is designed to be used with IQAir units or independently to understand the quality of your indoor. The AirVisual Pro uses Cloud computing, data, and artificial intelligence to provide not only the best predictive analytics but also advice. It stores 5 years of data accessible through the app or the provided URL. Note: It does not measure tVOCs. 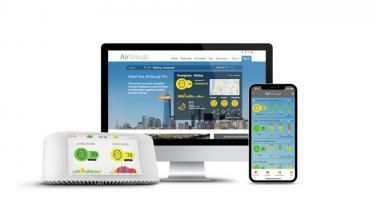 Your AirVisual App also offers 72 hour air pollution and weather forecasts so you know how to prepare before you go out. Portable and accurate air quality monitor. Lightweight so you can take it with you. See the invisible. PM 2.5 are tiny and can be dangerous. Now you won't be caught by surprise.